A bustle constitutes the way in which the train of your wedding dress is gathered, elevated off of the floor, and distributed across the back of your dress. 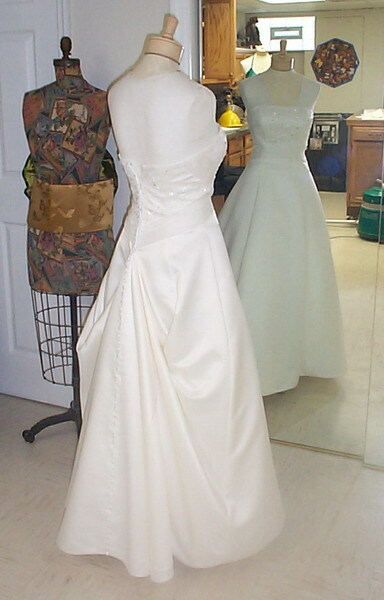 Many women opt to have their wedding dress bustled in order to facilitate movement after the wedding ceremony is over. After all, it can be uncomfortable and tiresome to deal with a long train while casually walking around, greeting wedding guests or dancing. The bustle is in use primarily to lift the long, elegant trains of wedding gowns off the floor. The long train is lifted with buttons or ties to create a lovely bouffant style that is also very practical. There are many different ways to bustle a wedding dress according to types of fabric, types of dress patterns and dress colors. You have several choices in bustles. The Over Bustle (also known as the Ballroom bustle) and the Under Bustle (also known as the French or Victorian bustle) are the most common. But you can also choose the Austrian or American/Pick-Up bustle these are less common but beautiful. You can choose the style you prefer and the one that will flatter your gown the best. 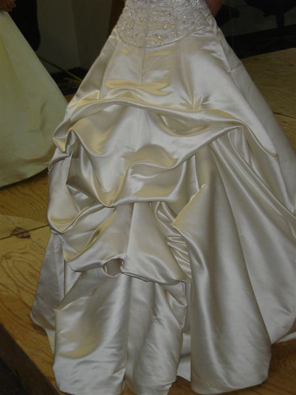 Use care in selecting your bustle style if your gown fabric is delicate. The weight of the gown on the bustles may tear transparent, lightweight, fabrics like organza. So if your fabric is delicate, choose a bustle style that reduces the weight on each individual bustle. The Over bustle also known as the Ballroom bustle consists of several hooks and eyes lifting your train off the floor. The “eyes” are placed along the waistline. The “hooks” are sewn in about 14″ to 20″ down the back skirt. Lace appliques, rosettes or bows may be needed to cover the hooks and eyes. Covered buttons also work well, and may look nicer, especially if you have buttons down the back of your gown.The longer your train is, the more hooks or buttons you will need. The Under Bustle also known as the French or Victorian bustle is usually done by tacking the extra material underneath the skirt and creating a bustle that way. This method works especially well for gowns without a waistline and gowns that are especially decorative in the back area, as it doesn’t cover up any lace or details in the gown right below the waist. 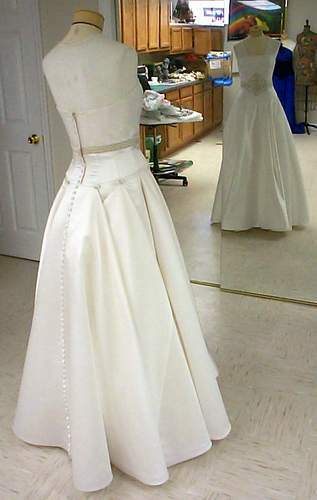 The gown is lifted from the bottom area and is essentially folded and gathered to shorten its length. For the Under Bustle, ribbons are sewn under the gown securing the outer fabric to the lining. Use different colors of ribbon to make the task of tying easier. The Under Bustle is more secure than the Over Bustle. The Austrian bustle is a secure bustle created by the use of a loop and pull system similiar to that of a window shade. A string is pulled and it bunches the train up.